BIRMINGHAM, Alabama, April 25, 2013 (ENS) – Black Warrior Riverkeeper filed a citizen lawsuit under the Clean Water Act and Surface Mining Control and Reclamation Act for 758 water pollution violations at the Shannon Mine. The surface coal mine, run by Shannon, LLC, operates in Jefferson and Tuscaloosa counties within the Upper Black Warrior River watershed. Filed Wednesday in U.S. District Court in Birmingham, the lawsuit addresses the company’s self-reported violations of its National Pollutant Discharge Elimination System Permit, NPDES, No. AL0076597 dating back to February 2010. 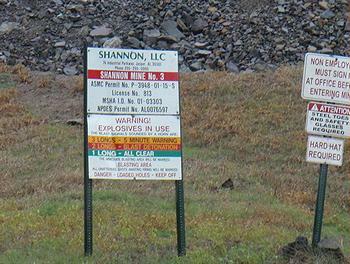 The lawsuit charges that Shannon, LLC has violated both federal and state laws. The nonprofit river advocacy organization is seeking a judgment declaring the discharges to be unlawful, and also a court injunction to prevent further pollutant discharges in violation of the mining company’s permit. Black Warrior Riverkeeper says in court documents that it has notified federal and state authorities of the discharge violations, but, neither the administrator of the U.S. Environmental Protection Agency nor the State of Alabama is prosecuting a civil or criminal action in a U.S. or Alabama court to require that Shannon, LLC comply with its discharge permit. Shannon Mine has discharged pollutants into an unnamed tributary to Little Blue Creek, Little Blue Creek, Lick Branch and Blue Creek in violation of its NPDES permit, which permits 76 water pollution discharges at the 6,321 acre mine. These streams flow into to Valley Creek, a tributary of Bankhead Lake on the Black Warrior River. Valley Creek and Bankhead Lake are popular destinations for fishing, swimming, canoeing and kayaking, and other recreation. Cited violations are primarily for selenium, which in larger amounts can be toxic to people and wildlife. Selenium bioaccumulates in the aquatic food chain and can result in selenium poisoning of fish, birds and other wildlife. The mine has also reported violations for iron and total suspended solids. The Black Warrior River drains parts of 17 Alabama counties. This area, the river’s watershed, covers 6,276 square miles in Alabama and measures roughly 300 miles from top to bottom. The Black Warrior River watershed is home to over one million residents and contains 16,145.89 miles of mapped streams. Earlier this month, the nonprofit American Rivers placed the Black Warrior River on its list of the country’s 10 most endangered rivers due to the effects of coal mining. Drinking water for the greater Birmingham area is threatened by the proposed Shepherd Bend Mine, a 1,773 acre coal mine coal mine on property owned by the University of Alabama. Drummond Company’s Shepherd Bend Mine would discharge wastewater into the Black Warrior River’s Mulberry Fork only 800 feet from the Birmingham Water Works Board’s intake, which provides drinking water for 200,000 citizens.